The competition is officially on, as the journey to finding the first Nigerian Idol is on and sizzling hot. Last week, a 100- man crew comprising of the production team, Selectors, Hosts, Wardrobe Stylists, Makeup artistes, Optima Media Group team, Etisalat team and judges made the first trip to Enugu to source for talents. 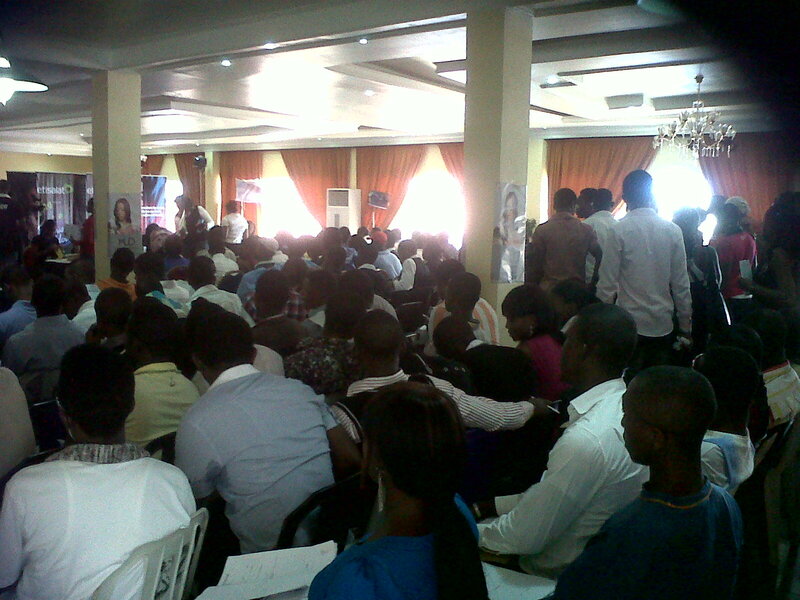 And this weekend, the train moves to Abuja for the second round of auditions at Nicon Luxury. “I am dying to see your future as a solo act” Daniel couldn’t help the smile as he gave out the first golden ticket of the day. Even though producers are yet to disclose the number of people selected from the Enugu auditions, they assure us that from October 15, 2010, fans of the franchise show will be able to watch behind the scene episodes on a designated channel on HITV. After Abuja, the next set of auditions will hold at Cultural Centre Calabar on October 22 and October 23, before the train moves back to Lagos on October 29, 30 and 31 at D Box Studios Omole. Year in year out talents scramble to audition for Idols all over the world. “This year as a matter of fact we should be expecting more. With Jeffery Daniels, Yinka Davies and Audu Maikori serving as judges the bar has been set even higher, and with the turnout in Enugu, we are assured that this is the real deal” Adaora Mbelu, Optima Media Group’s Communications Manager says. The High budget project will run on TV from November 2010 to March 2011. Host Misi, an OAP with a Lagos based radio station will take viewers through raw auditions, judges’ auditions, theatre auditions, live shows, evictions all the way to finals. And she’s got help too! Sierra Leone born Anis Holloway who made his first appearance as a wannabe singer on Project Fame last year before moving on to Nigezie as a presenter will be co-hosting the show. “This is a big challenge and I am ready for it, Enugu was fun, Abuja is the next stop” an excited Misi says before leaving for Abuja this week.